Messenger style bag with abstract "plant cell" design accenting exterior flap and inside pocket. Brief has an orange interior liner with iPad pocket, zippered pocket, and three other accessory pockets. Messenger style bag with iPad pocket. 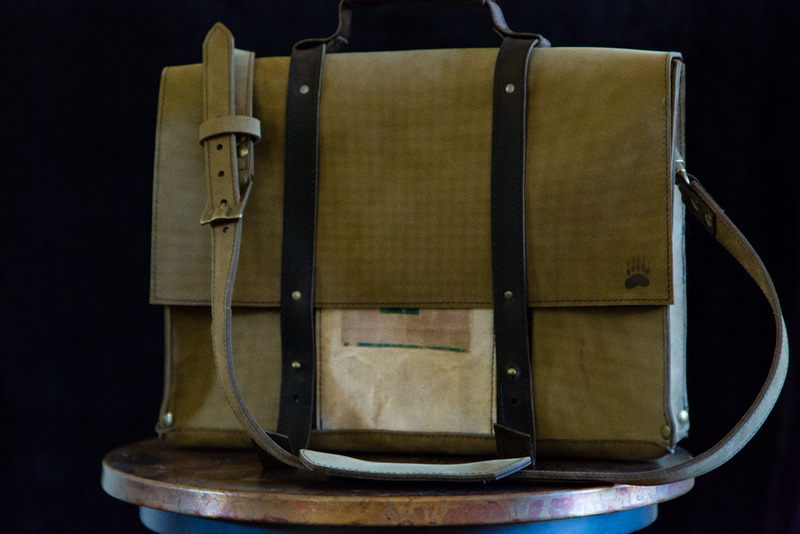 Messenger style bag with a vintage canvas insert. Lined with green fabric with multiple interior pockets. 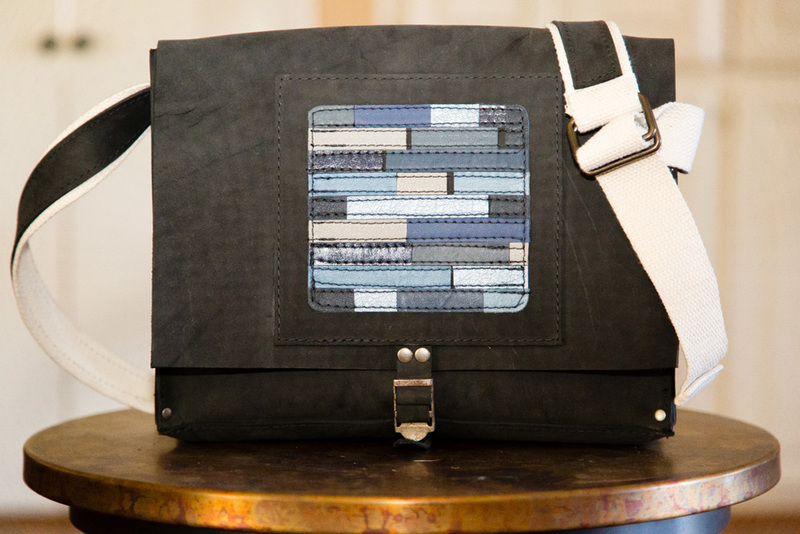 iPad tote created of distressed leather with a woven strap, interior pockets lined with linen. Expandable opening secured with buttons, lined with orange fabric with multiple utilitarian pockets. Demonstating interior color and securing buttons that allow opening to expand. Ladies handbag with snap closure and mid-length shoulder strap. Small purse, perfect for a compact and iPhone. Patent leather bag with interior lined with pigskin, contains two interior pockets. Handbag lined with Day of the Dead fabric, hidden detachable shoulder strap. Day of the Dead fabric liner, hidden detachable shoulder strap. Gold textured leather clutch, completely hand sewn, has wrist strap and ornate decorative accent on flap. Blue leather messenger style bag with lizard skin accent on flap. Zipper closure, exterior and interior pockets. 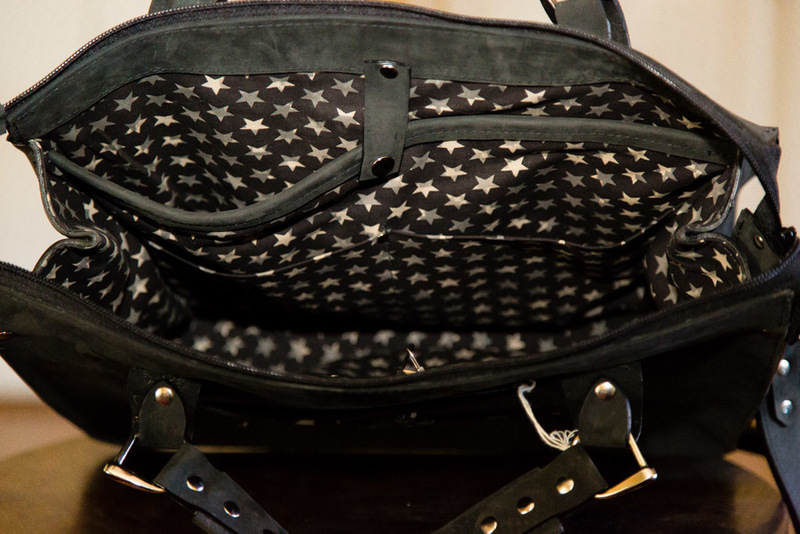 Cowhide saddlebag style, Spike and chain closure, roomy interior. Rich, red leather briefcase with multiple interior and exterior pockets (some zippered), adjustable strap that also detaches. Opened demonstrating interior pockets and green plaid liner. Messenger bag with coyote skin flap. Completely handsewn, lined with golden fabric with large interior pocket. Zipper pulls are "faux" animal claws. Filbert-styled briefcase with multiple pockets within, adjustable and detachable shoulder strap. Interior liner matches the fabric portion of star on exterior pocket. 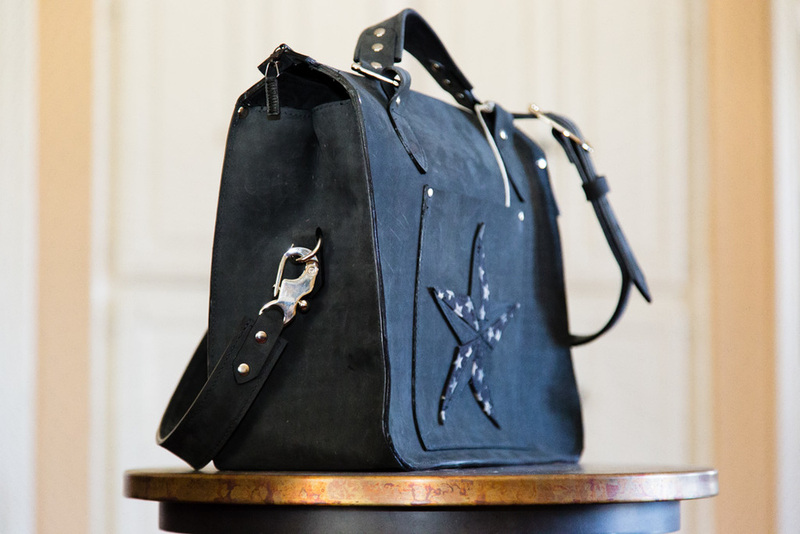 Star created from sections of leather wrapped with interior liner fabric. Woven strap with leather accents, Flap detail consists of a mosaic of various types of blue tanned leather. Lined with multiple pockets. Medium messenger bag constructed entirely of ostrich leather-extremely soft, collapses for travel. Lined with interior pockets, exterior pocket has hand-painted bear paw detail. 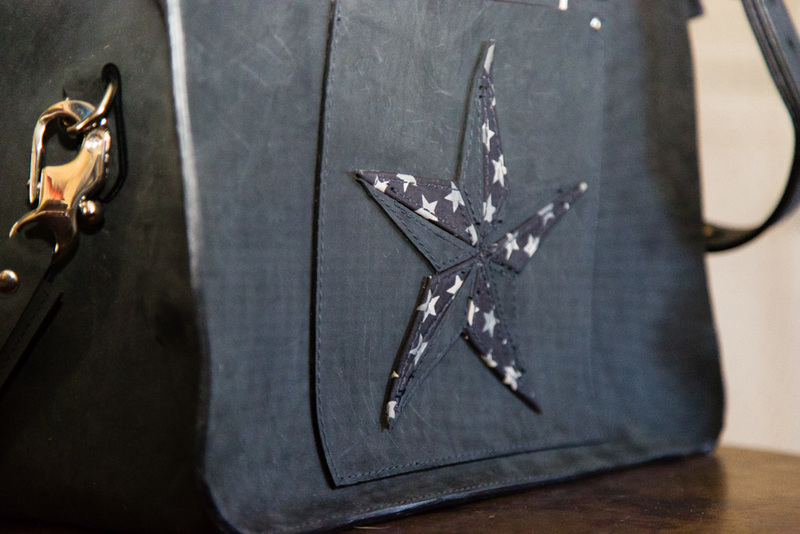 Lined with vintage canvas, vintage accent on exterior flap, raw leather detail along edge of flap. Flap opened revealing exterior pocket with raw edge detailing. Simple backpack with buckle closure. Single detachable strap, designed to be worn over a single shoulder. Custom designed for a unique individual, Textured leather flap, lined with multiple interior pockets. Gold textured leather, Hand-sewn, Swarkoski crystal Fleur-de-Lis and rivets. Leather backpack lined with mattress ticking, multiple exterior and interior pockets, single iPad pocket. Custom designed messenger bag lined with multiple pockets, Flap is embosssed vinyl wrapped around leather. Black patent leather clutch, lined with leather with a single interior pocket. Accented with brass snaffle bit and stirrups. Leather handbag textured to resemble lizard. Handbag created from champagne tinted leather, fully lined with interior pockets. Leather clutch with stingray accented flap, hand-sewn, beaded wrist strap and swarkowski crystal rivets. Textured leather clutch with swing latch closure. Custom made bag with removable canvas interior. Vintage leather and canvas accents. Detachable liner connected via snaps, completely machine washable. Leather bag with skull lace overlay, leather drawstring closure. Constructed entirely of a single Python snakeskin, interior leather lined. Cowhide dyed to resemble zebra skin. Fabric lined with interior pockets. The George Brief-fully zippered leather portfolio with detachable strap and multiple interior pockets. 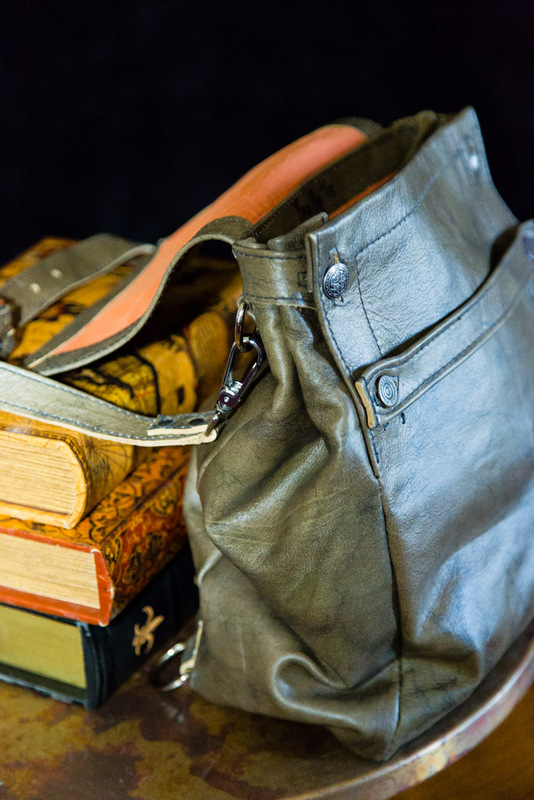 Created with canvas acquired from historical books, interior pockets, detachable leather shoulder strap. Authentic bison hide tote, lined with orange fabric with interior pockets, zippered closure. Leather lined with multiple interior pockets, drawstring closure. Distressed Doctor's Bag with mattress ticking lining. Doctor's Bag with steampunk accents and closure. Opens with a retro expansive hinged clasp. Lined with pockets. Side view of Steampunk Doctor's Bag. Made with vintage canvas from a Texas county records building. All leather duffel bag--identification brand of hide visible on exterior pocket flap. 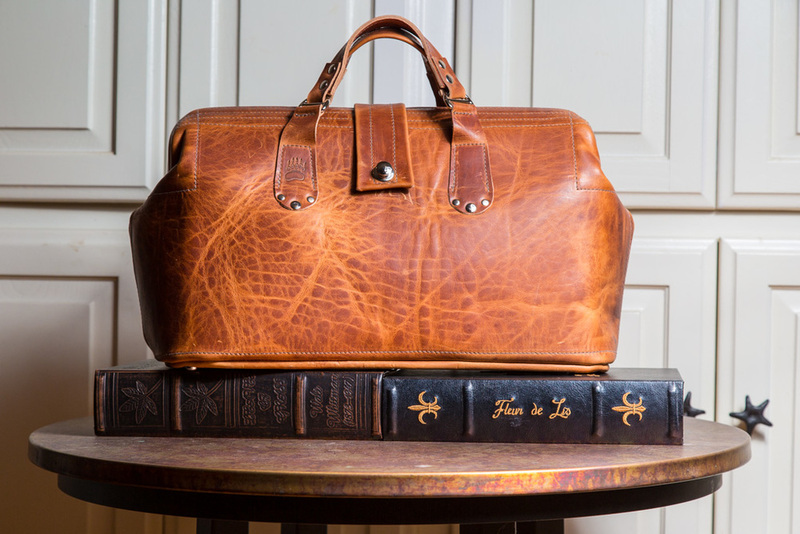 Side view of Leather Duffel bag. Removable shoulder strap. Embossed leather backpack with adjustable inner drawstring. Side view of embossed leather backpack. Embossed leather "hip" bag. Unlined. Leather "hip" bag with exterior pocket-closed with peg and hole closure. This three pocket Yoke backpack is lined in the large pocket and the strap carries left or right. This Weekender is lined with black linen and has one large inside pocket and skull riviets It is the largest carry on size and will fitin the overhead compartment. This leather tote is lined with vintage canvas and has one inside pocket. Envelope Messenger has a slot for a tablet and a zipper pocket inside with a button down access flap. Flapless messenger has three outside pockets and three inside pockets. Zipper and snap closure and lined with blue plaid linen. 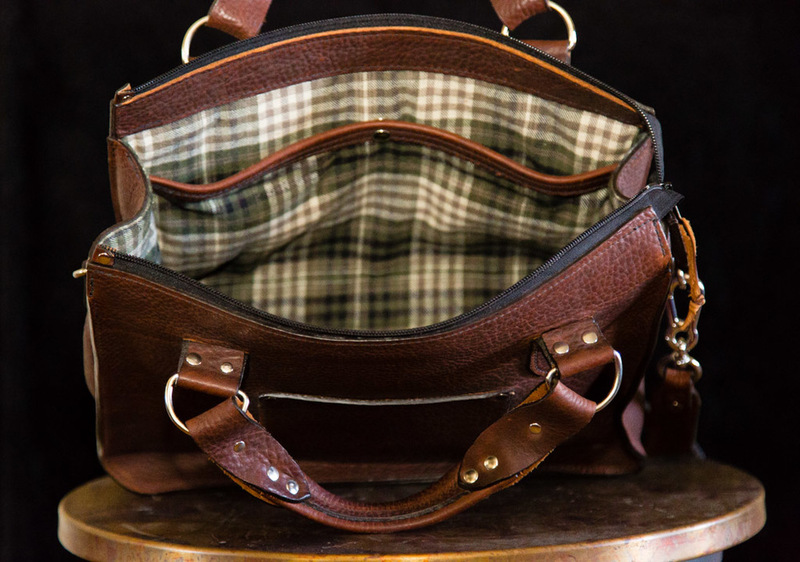 This brief four outside pockets and is lined with green plaid with four inside pockets. It is a mix of green and brown leather . This leather and linen tote is lined with blue plaid linen .